Update: Parking information and an annotated campus map are now available. Poster Dimensions: Posters for the conference are to be 4 feet wide by 3 feet high. ICCM is being co-located with BRIMS 2013! 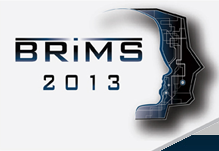 BRIMS (Behavior Representation in Modeling and Simulation) 2013 was originally cancelled, but instead is being held with ICCM 2013 on July 11 - 14. ICCM is the main international conference for computational models of human cognition. It is at the forefront of research into how to model all aspects of human cognition and behavior, as well as methodologies for validating the models. The conference has run since 1996, and attracts the leading researchers in this field. All modeling research areas, including symbolic AI, distributed representations, and neural spike coding, are featured in ICCM, with an emphasis on the creation of cognitive architectures: that is, we emphasize the development of general-purpose computational systems for simulating complex, human cognitive abilities. ICCM encourages researchers to make their models publicly available, so as to encourage model re-use and comparisons. ICCM maintains an online archive of papers, presentations, and models from previous years, available at http://iccm-conference.org.